Being that I am taking part in the Handmade Pledge I thought I would stop and take a moment to help buyers who are new to Etsy (and perhaps working off someone else's wish list) learn how to effectively shop Etsy. This list is based on my own experiences last year giving people a wish list of Etsy items. If you would like to send these helpful tips to others, simply direct them to this link! Thank you! 1. But it's already sold!!! 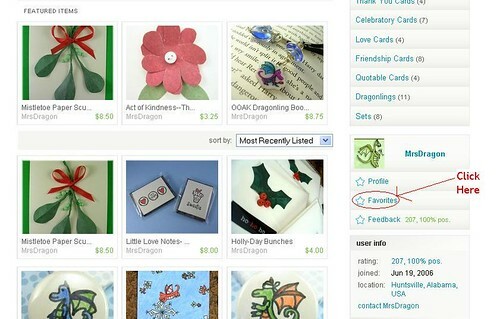 Because Etsy is a handmade site, each item has to be listed individually. Because sellers want to spread out their listings to maximize exposure, they typically place very low quantities up for sale at a given time. This DOES NOT necessarily mean the item is one of a kind (OOAK). Even if the item were one of a kind, the great thing about handmade items is that there is a good chance that they could make something similar. If someone has sent you a link to an item that you would like to purchase and that page says that it is already sold, you have two options. a) Check the seller's store to see if they have listed anything similar. You can do this by clicking on the word "shop" underneath the seller's name in the sidebar to the right. From there you can browse their store. b) Ask the seller directly. 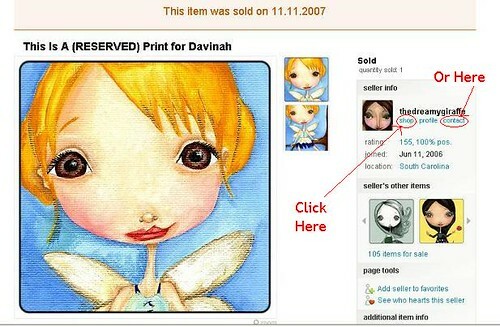 You can do this by clicking on the word "contact" underneath the seller's name in the sidebar to the right. This will open up a "conversation" between you and the seller. 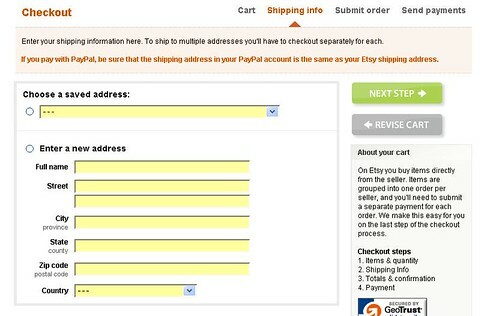 (Note: in order for this to work, you must be logged into your Etsy account). Most sellers will respond to you within a day or two. PLEASE NOTE: If you choose to contact sellers, the default way for them to contact you back is through the conversation feature. 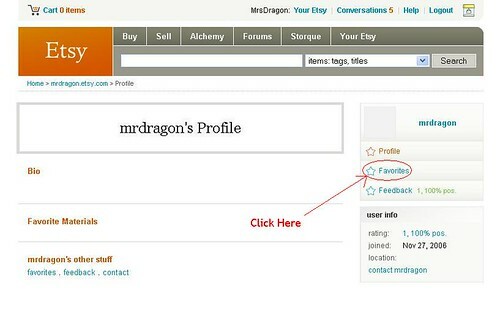 If you are not going to be logging into Etsy frequently, you may wish to ask them to email you directly. 2. I can't find anything Because Etsy's search engine relies on the tags and titles that sellers give their own items the results can be a bit unpredictable. If you are finding that you are getting a lot of the "wrong" items, trying using an exclusionary search. Which is just a fancy way of saying add NOT into your search with the term you want to exclude. into the search bar. The results that were returned to me would then be only items that both included the word peridot and did not include the word jewelry. Also, if you are having trouble finding things, check the spelling of your search terms. Business not buisness. Jewelry not jewlery. Etc. 3. Is there anyway I can find my friend's wish list on Etsy? 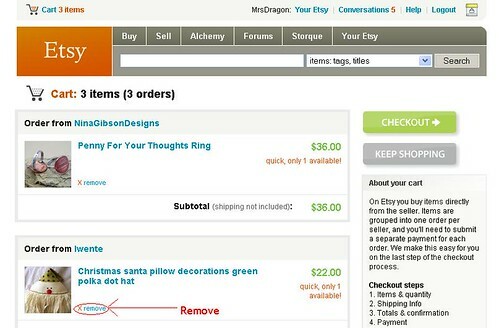 Unlike Amazon, Etsy does not have a specific "wish list" feature like you may be familiar with. Instead, Etsy has "favorites". 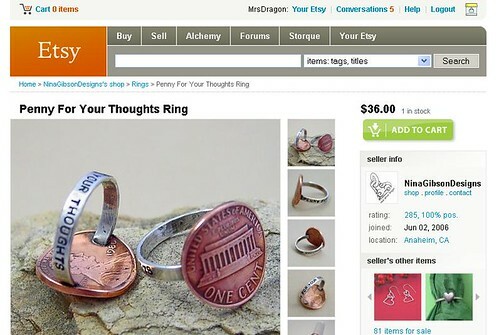 If you know an etsy user's name, and they have their favorites set to public, you can look at them and see what they have marked. This works regardless of if the person has a shop on Etsy or not. That will bring you to either a shop (if they are a store owner) or a profile page (if they are solely a buyer). Look to the right and click on "favorites". If they are a seller, it's a bit trickier to find because there is so much more stuff on the page. Scroll down until you see their avatar (a small picture) in the right hand sidebar. Look just under that and click "favorites". One cautionary note about shopping off favorite lists. Each person uses them differently. For instance, I add things to my lists that I love (and want to own), pieces that inspire me, things I just like for no real reason, things with really great design elements, gift ideas for others, several contenders when I am shopping for something particular, or just things I want to save to show someone later. It is always best to know the person you are shopping for! 4. How does buying work? 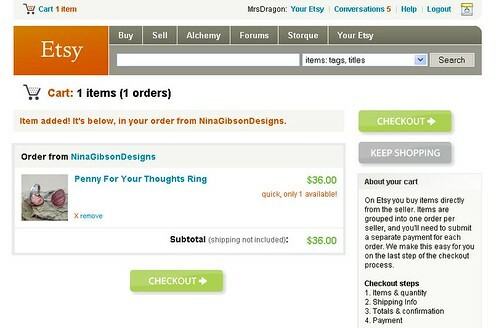 Etsy allows you to keep a "shopping cart" while you are shopping. 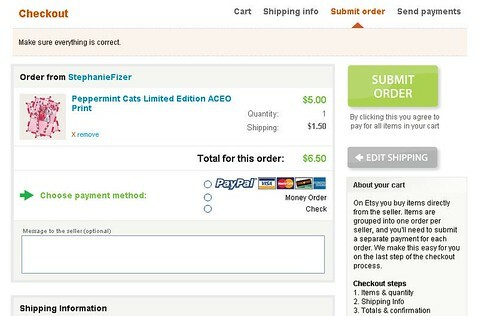 To add an item to your cart simply select the big green button that says "Add to Cart" in the upper right hand corner. This will take you to a new page that shows what you have in your cart. You can either checkout or continue shopping. To continue shopping hit the gray "Keep Shopping" button on the upper right and you will be taken back to the shop you just added an item from. You can continue browsing the site (and even use the back button on your browser to get back to the favorites page if you like. The item that you added will stay in your cart. You can add as many items as you like and you can always return to your cart from the little icon in the upper left. The items you select will be grouped by seller. To remove something from you cart, simply click where it says "X Remove". When you are ready, click on "Checkout". This will take to you a page where you can enter your address. Once you do, click on "Next Step". You will be taken to a page where you will select your payment type and can add any notes to the seller. The message to seller box is the place to give the seller any information that they may need to complete your order like size, color, message, etc. You can also write them a short note or say thanks or just leave it blank. When you are ready click on the big green "Submit Order" button. Once you have done this you have committed yourself to the purchase and must pay. The next page will show you everything you have bought and your totals from each seller with shipping included. You will need to pay each seller individually from this page. If you are paying with paypal, you can simply click on the paypal buttons for each seller. If you are paying through another method, this shows the amount you will need to pay. 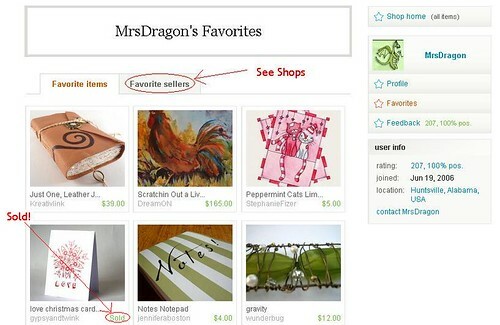 This is a great idea - so much easier for the new to Etsy shopper to find what they're looking for while browsing the site! thanks so much for taking the time to post all of this!